-Spectacular views overlooking Cape Cod Bay and the coastline from Provincetown to Plymouth. -Brand new bathrooms and fully equipped kitchen. -All but one room overlooks the ocean and beach. -Steps to the private beach over the sand dunes. -Enjoy sandbars, swimming, fishing, kayaking,and miles of private beaches. -One Queen bedroom with ocean view from pillow! -Hard wood floors and floor to ceiling windows overlooking the ocean. Quiet and private neighborhood in pristine Sandy Neck beach area on Cape Cod Bay, "SeasCape" is nestled high on a dune with plenty of outdoor living and open floor plan inside overlooking Cape Cod Bay along a ten mile stretch of beach with private access.The sand dunes, low tide sand bars, tidal pools, and clean ocean water make this beach a special place. The magnificent sunrises and sunsets form this well situated home perched high on the dune is evident in the pictures. Enjoy the sight of ducks, shore birds, whales, song birds and other wild life from the deck. Artists will enjoy the spectacular colors of the ocean sunrise and sunsets as well as the changing Fall colors of the marsh. Winter is for adventure seekers and those romantic long weekends away from the city. Spring is especially great for birding and just walking the beach and beach combing. All seasons you will see ample wildlife such as turkeys, bunnies, red fox, coyotes, deer, fish and fowl, whales, seals, badgers, we have even seen baby otters. The natural world of the shore in all it's glory! We are sure your stay at SeasCape will not disappoint. As the last and the best of the Hannah Family Beach cottages, 'SeasCape' was always fondly referred to as #1. There were 9 beach houses, all in Scorton Shores and Sandwich Downs and the Scorton River Motel on 6A which Aunt June and Aunt Lib rented to thousands of guests since the late 1950's. I continue the Hannah Family tradition by meeting and greeting all my new guests and have many return guests year after year. SinceI have been renting this for 35 years and am new to the new online rental business, I still call to make sure this is a good fit. If your vacation needs are all about nature, sea, beach and sky- a quiet, private location and above all, a spectacular Cape Cod Bay view, than it's a great fit! Location-10 Miles Stretch of Beach and Sand Dunes- All private Beaches and 7 miles of Sandy Neck Beach to Barnstable Harbor - All out your back door Privacy and a spectacular views, steps from private beach, no driving, no traffic, no crowds VIEW Sunrises and Sunsets over Cape Cod Bay Large upper deck perched high with gate overlooking Plymouth to Provincetown Birding all around you Well maintained and updated by owner Outside enclosed Hot/cold shower on lower deck, a renter favorite Raised Hearth Fireplace, Romantic Currier and Ives Town of Sandwich Summer or Winter Great Restaurants and Taverns nearby Beautifully maintained with everything you need Great central location on Cape Off Scenic 6A Ask and we'll try to accommodate your wish Drive here, have provisions and never leave. Swimming, Walking, running, Kayaking, paddle boarding, beach combing, sand castle building, skim boarding, fishing, tennis, biking, reading, movies, yoga,colorful skies and bird watching are just some of the free entertainment here at the 'SeasCape' Cottage! Lastly, Original oil Paintings by Aunt June! 2 private decks overlooking Cape Cod Bay while nestled the natural greenery surrounding the house Outside Hot/ Cold Shower Winter or Summer, the Sunrises and Sunsets are spectacular. All the colors of nature abound..also the marsh view to the left is gorgeous in Autumn. could fit a wheel chair, big and deep soaking tub with shower, comfort height toilet, pedestal sink. Panoramic ocean and beach views of Cape Cod Bay from almost every room inside and from two ocean side decks. Easy Access over the boardwalk to your expansive private beach from Scorton Creek to Sandy Neck, with sand bars and tidal pools. Kayaking, swimming, fishing , bird watching and beach combing! Panoramic views from Plymouth to Provincetown from walking in the door to the kitchen sink! 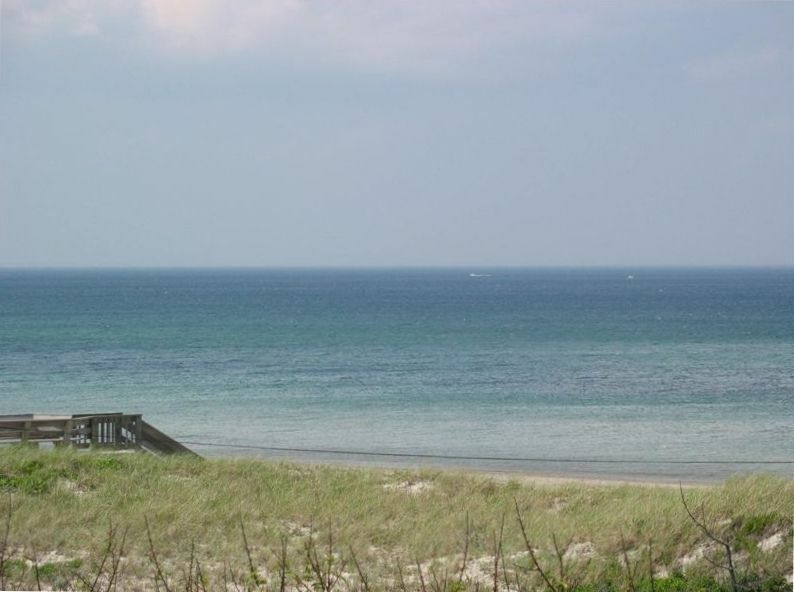 Situated high on a dune for spectacular views of Cape Cod Bay , access to boardwalk to a private beach. 10 stairs, approx. raised brick hearth, Mendota gas fireplace with a remote switch, instant ambiance and heat. wheelchair fits through the bathroom door one floor living with gorgeous ocean views from just about everywhere! Outdoor shower, 3 beach chairs, large and small cooler, beach toys, Beach umbrella, yoga mats, tennis racquets, set of golf clubs and 2 fishing rods provided. Deck furniture, zero gravity chairs, and market style umbrella over picnic table. Wonderful location . Comfortable home with great views and a wonderful deck. We enjoyed grilling out and long walks on the beach. The cottage was charming, comfortable and a delight to live in...The hostess had puzzles, games, books, DVD player, and cable television...The dining room table was spacious and had a great view... and the hot water was hot. Bring along a wall clock because the only timekeepers were on the microwave and the electric stove.There is only one clothes closet; but there are lots of bureau drawers in every bedroom. We were very pleased with the neighborhood. The people we passed on the beach were friendly and talkative. There are 18 steps (attached to the boardwalk) to get down to the beach...my elderly friend was not able to get to the sand but she enjoyed sitting on the built-in benches on the boardwalk near the stairs. If you like a plain ole seashore cottage...you'll love this one ! Our hosts left a bottle of wine and box of candy to make sure we felt welcome as soon as we walked in. The home has everything you need to cook or BBQ. There are lots of books and DVDs as well but you probably won't want to leave the deck---it is huge, close enough to hear waves and ocean views are truly amazing. Perfect beachside cabin with great ocean views! This is a lovely cozy little cabin perfectly situated for ocean views. You can see the ocean from every room in the house and it has a great deck with table and a variety of chairs: adirondack, zero gravity, beach chairs as well as all kinds of other supplies for vacation fun such as tennis rackets, golf clubs, life jackets, surf boards etc. it has everything you need for a fun and fulfilling vacation. Also, it is just steps from the beach access. Janice is also a very lovely person and so gracious and easy to work with. Highly recommend!! Great place very quite off-season, wonderful ocean views and spotlessly clean. One hour from Boston and Providence. Skydiving, glider rides, whale watch and fishing boat charters out of Barnstable Harbor, concerts, plays, Cape Cod Melody Tent are within 7 miles for those active vacations. This quiet, serene setting is all you need for a restful and nature filled vacation. Over the dune to the private beach you can walk for 10 miles along the ocean. From 'Sandy Neck' to 'Scorton Creek', this marsh on the back side makes this pristine area of East Sandwich a virtual island.